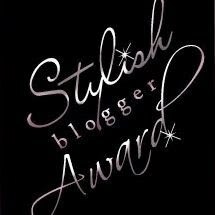 I recently got a comment from the lovely Katherine over at Something in the Way She Sews informing me that she'd passed on a Stylish Blogger Award to me. So SWEET! I'd encourage you to go check out her blog and see her charming creations, including her recent Yellow Pleated Skirt. It is perfect for Spring and now I want one for my own. Along with the award come the challenge to reveal 7 things you may not know about me and name 7 other bloggers that I would award as well. I'm anti-superstitious. Having my birthday on the 13th, landing on a Friday every now and then, is the source for that. So if there is a superstition I can flaunt, I do. I hate tomatoes. OK, I can handle them in certain (mostly sauce-like) forms, but the thing that gets me is those seeds. Gooey, gel covered seeds of any kind freak me out, especially those in tomatoes. I'm convinced someday aliens will spawn from them or something. I take contagious yawning too far. I think I must be a perfect candidate for hypnosis, because things can be suggested that easily to me. You don't even have to yawn. You can just say "yawn" or associated words like "sleepy" and "tired" and I will continue to yawn several times in response. One friend of mine thought this was so funny that he did a Pavlov's Dog experiment on me, subconsciously training me to now yawn in response to the word "lampshade". Not nice. I am (almost) the shortest woman in my family at 5'10 and 3/4. The official shortest was just a quarter inch less than that. I don't think that is really so tall, but am reminded others think so when they stand next to me with gaping jaw and declare it. Though I come from Irish and Jewish blood, two ethnicities that people often associate with much shorter stock, I seem to have come from the taller gene pools. On a related note, I was 5'6 by the time I was 12, and regularly mistaken for a college/university graduate. Through my teen years, I was constantly assumed to be considerably older than I was, perhaps culminating at 16 when a woman thought I was 30. Now, it seems, I look much closer to my own age. Not sure when it started reversing. I have lived in three ends of this continent so far: Southern California, NYC, and now Vancouver. What is next? Swimming pool chlorine is a comfort smell to me. I grew up swimming in pools constantly during my younger years. This was, unfortunately, the source of my numerous ear infections and subsequent hearing damage, but I just loved being in the water so much. There is nothing quite like the feeling of water all around you. So now whenever I smell that classic mix of swimming pool chemicals I think back to that lovely sensation. There we are. I wouldn't be the least bit surprised if these ladies have already been tagged, but that is how it goes. In addition to this kind award, this post also marks me having 30 listed followers of this blog! That may not seem a big deal to others, but it is to me. So thank you all out there.